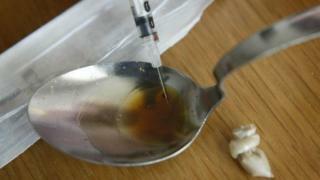 Heroin use in Scotland appears to be declining, according to official figures. The annual report of the Scottish Drugs Misuse Database (SDMD) suggests a particular decline among young users. Ten years ago, 58% of users under the age of 25 reported using heroin. That proportion has now fallen to 25%. And the figures indicate there has also been a drop in the number of users injecting drugs from 28% in 2006/7 to 18% in 2016/17. Use of cocaine and crack cocaine has increased - it is now reported by 19% of users. SDMD said this may be related to decreases in price and increases in purity of cocaine reported across Europe. Across Scotland, almost 18,000 people were given initial assessments for drug treatment, with a majority (51%) over the age of 35, reflecting a recent ageing of the drug-using population. In all NHS board areas with the exception of Grampian and Lanarkshire, heroin, cannabis and diazepam were the drugs most often reported to have been used in the month before assessment. In Grampian and Lanarkshire, cocaine/crack cocaine was the third most commonly-used drug. Of those reporting recent illicit drug use, heroin was most commonly reported in Fife (67%), compared with only 37% in Lanarkshire. Cannabis was recently used by up to 45% of individuals in the Western Isles, followed by Forth Valley (37%), while the highest percentage of recent diazepam usage (41%) was observed in Grampian.